Good afternoon, everyone. It's been a gorgeous day here in Vancouver and I am so thankful for the extra vitamin D because I really really need it right now. I'm also thankful for the chance to go for a walk without getting soaking wet from the rain. I was extremely motivated to walk every night regardless of the weather a few weeks ago but then I got hit with some extra fatigue and it was a lot harder to make myself (and my husband) get out into the rain. It was then that I decided that watching netflix on the couch would be just as healthy for me and the baby as being active. (I'm going to be a great mom). On Easter Sunday I had a serious craving for something sweet around 7pm. A legitimate obsessive craving so I asked Kevin to go to the grocery store for some Easter treats. (I haven't sent him on any crazy craving runs just yet so don't worry, he's doing fine haha). Turns out the grocery store was closed for Easter which I was not happy about. I didn't want to send Kevin on a wild goose chase so I thought if I just distracted myself for a little while the craving would go away. It. Did. Not. I ended up looking through my pinterest boards for a recipe that would curb my craving for sweets while having less of a sugary impact than sugar cubes. 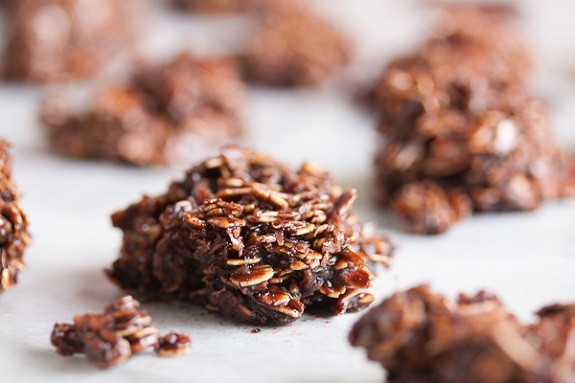 I stumbled across this recipe for No Bake Chocolate Macaroons and while it's not "healthy", I do think it's a better choice than what I would have chosen from the grocery store. I only made half a batch to be safe but I was extremely happy with the results and I knew I had to share them. I didn't take photos while making them because I was a woman on a sugary mission and the last thing on my mind was the idea of blogging. Nothing stands in the way of me and my treats. You can find this delicious recipe here. If you have any healthy-ish recipes that could help curb my sweet cravings please pass them along! I have been eating more fruit and that helps sometimes but other times I just need something chocolatey and indulgent.